Top 50 Artists: We analyzed all posts in 2013 to find the 50 most-discussed artists, and asked Séamus Gallagher to illustrate. Listen to a track from each of the artists while you scroll, and click through to their latest release. Top 50 Tracks: We compiled a list of tracks favorited the most on the site throughout the year, and asked some of the year’s top artists to make a mix. The first one up is from HAIM, and we’ve got more coming every day this week. You can also see the full track list here. Enjoy this look back at the music of 2013! And if you’re looking for more best-of music lists, Largehearted Boy has the ultimate resource. As an extra bonus, we’ve also compiled the list of album premieres that we have had in 2013, and restored the older Zeitgeist releases from 2007–2012 to their former glory. Let the archivist in you dive in! UPDATE: As if it wasn’t enough, we also wrapped up 2013 in UK blogs along with BBC6 Music. Give it a listen! what happened to top albums??? No top albums this year? That was my favorite feature of this blog! Good work guys! Thanks for all the hard work you put into the Hype Machine. Thank you for your effort and this great listing. However, I agree with the others that the album ranking was far more interesting than the song rating! It IS distinctive to the artist ranking (if not i’d suggest you drop the artist ranking) and is/was distinctive to all the other top-lists on the internet and for me the one i was looking forward to for 365 days each year. I appreciate the work you put into this, but if you’re looking for feedback, I’m VERY interested in the top albums of the year. It was a great way to discover the best music from the past 12 months. Hope you’ll consider bringing it back next time around! When are you going to release the end of the year mixes? I still listen to 2011 weekly! I 100% agree with everyone who’s posted here — the Top Albums list was always by far the most interesting feature of the Zeitgeist for me. Disappointed to see it missing this year. soo disappointed about the lack of top albums. I guess I will no longer be making my annual visits to hypem… Seriously that used to be one of my favourite times of the year, I am heart broken guys. Total fail! Solid work but I feel like the top albums were always the highlight of the year end Zeitgeist. I’m really sad to see this not included this year. Since 2008, it was my annual guide for catching up on the albums that I somehow missed (and thus, spend more time on Hype Machine). Have not looked thoroughly yet, but I can see why it is not essential for Hypem to compile top albums list – it is just not what the zine dedicated to. Hypem is about individual tracks, so the singles list is what is not interchangable. I am also among those people who has enjoyed previous lists and especially the art surrounding it, but I can easily live without another one (top albums list). Good luck, Hypem! Follow your inspirations and you will never get lost! Always enjoyed your mixes. But I am little disappointed as there are no top albums. 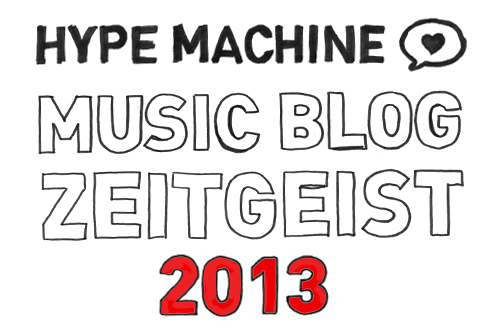 When is this years Zeitgeist coming out and top artist and albums of 2014?